It is almost mid February and the sun is due back in a couple of weeks. The light increases by half an hour a day but still there is no more than dusk light conditions for a couple of hours a day, making our day at the beach a fairly short one. Still we had plenty of time to experience the light, the sounds, the textures, and not least the built environment of this northernmost beachfront in the world. Of course there are Greenlandic settlements that are, as they always were, shoreline communities, where hunting and fishing make the beach zones dynamic. Longyearbyen, however, displays what might be called an industrialized beach zone, with an industrial harbor area, a cruise ship quay, and a container quay. It also features a strip of informal, and charming, beachfront houses. Starting out about mid-way between the city and the airport we approached the shoreline at the very edge of the harbor area of what seems to be a major snow deposit area. The edge is harsh with a vertical land cut to the sea. As the edge softens and the beach zone extends, we proceeded to walk along the beach houses. Each house has a unique character of its own with make-shift furniture decorating the short beach front. Barbeques, boats, kayaks, benches and even a bath appear scattered along this beachfront but were obviously placed there deliberately and ready for use in the warmer months ahead. Most compelling still was the immaterial conditions of the beach zone – the rush of sounds from the muddy waves crashing on the shore, the faint glow on the mountains on the opposite side of the fjord, the shine on the ice boulders shifting between land and sea and polished by the unrelenting waves. Planes, helicopters, snow scooters temporarily disturb this precious path of pleasure. 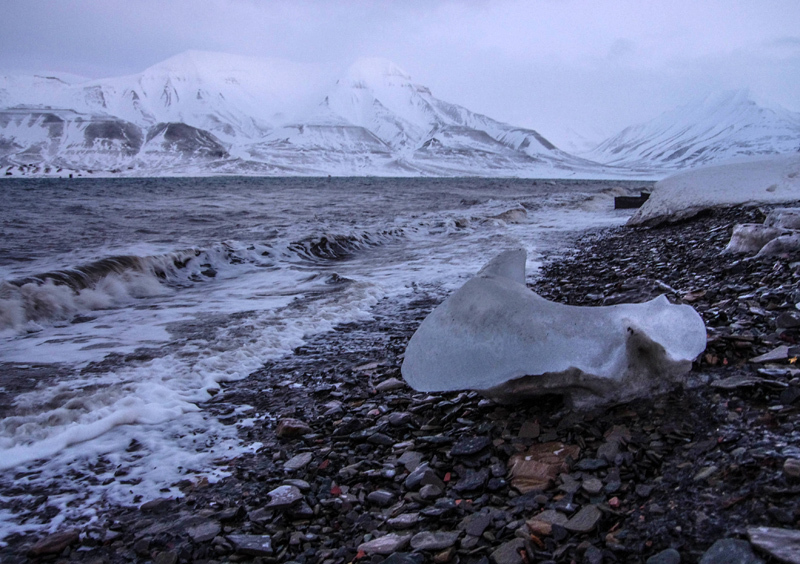 The view across the fjord contrasts strongly to the Longyearbyen shores. With the distance one loses the detail of the opposite shore, which appears to feature traces of former activity and dwellings. It performs like a silent scene of pristine white hills, with a distinct pinkish hue along its crest. The rhythmic waves, however, gradually immerse the body back to the shoreline where the sound of the material beneath our feet offers an unstable occupancy where we must weave and negotiate our way. The ice and pebbles are mingling and rubbing against each other, all moved by the tide and wave relentlessly working upon the shore. 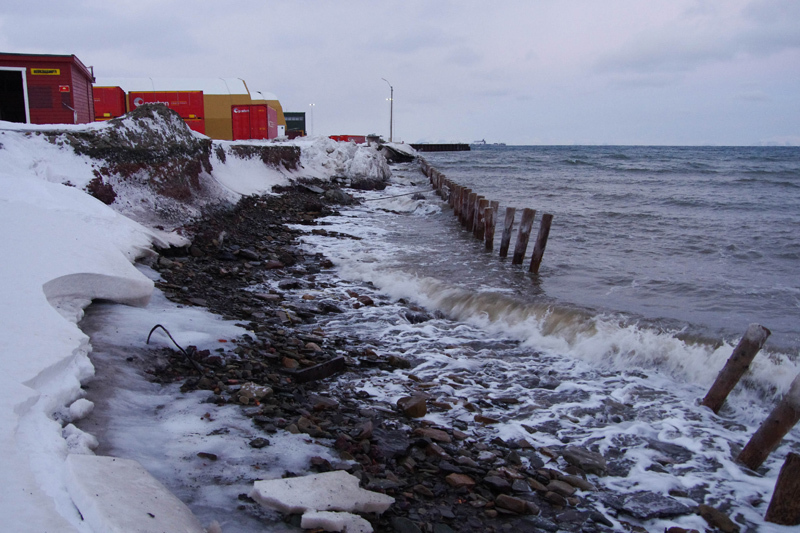 Tidal time and geologic time seem to be a reminder of the precariousness of the settlement behind us. 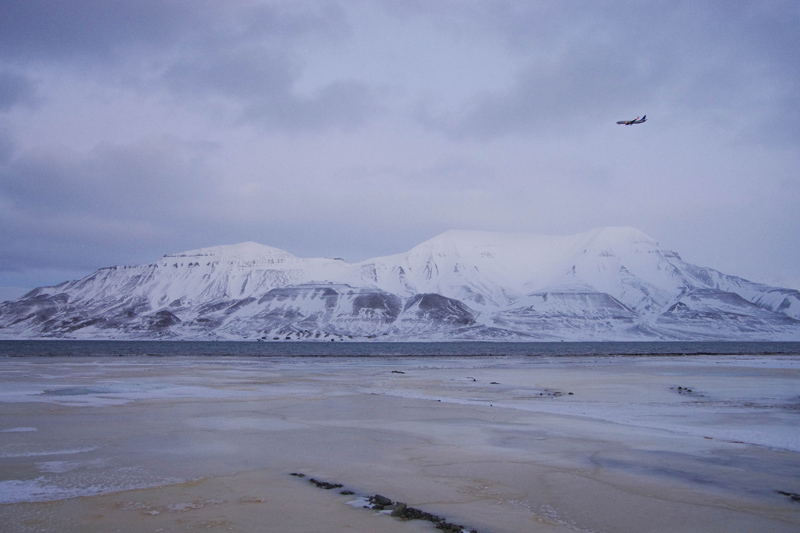 Longyearbyen, like most high Arctic settlements, must contend with the constant adverse weather conditions such as low temperatures, permafrost, strong winds and snowdrifts to create a distinct functional aesthetic. The constant processes of climate, tides and geology raises reflections on the vulnerabilities of such settlements. The town, like us on the beach, is exposed to these processes that underline the temporality of our very being.